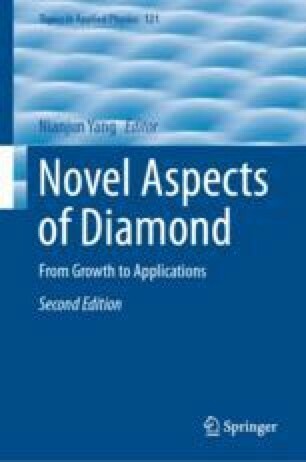 Nanodiamond is one of the carbon families that has attracted much attention recently for its versatile spectroscopic properties; render it promising potential in optoelectronic, quantum computation, and bio/medical applications. With sizes ranging from several hundred down to single digit nanometers, nanodiamond represents a group of nanomaterial with rich surfaces both in its physical and chemical properties. Its surface and bulk consist of carbon of bonding of different nature. The sp2/sp3 hybridization forming diamond, graphite, disorder/amorphous carbons and defects are easily detectable using infrared and Raman spectroscopy and allow both easy characterization and the surface modification or conjugation with molecules of interest. Recently nanodiamond is considered as one of the most biocompatible nanomaterials. With the newly discussed defects-originated fluorescence, renders nanodiamond suitable for bio-labeling, bio-sensing and drug delivery. In this chapter, the authors review and discuss the spectroscopic studies of nanodiamond surfaces focusing on the infrared spectroscopy, Raman spectroscopy, including SERS, photoluminescence spectroscopy and lifetime analysis. Applications of these methods to detect and analyze surface structural features, surface molecular groups and macromolecules conjugations, interactions between nanodiamond surface moieties and its environments, etc. are discussed. These open new possibilities for bio-medical applications, for multimodal imaging, sensing, and controllable drug delivery of nanodiamond. The authors appreciate the financial support of this research by the Ministry of Science and Technology (MOST) of Taiwan, Grant No. MOST 106-2112-M-259-009-MY3.